One of the problems I always had with Dark Sun was that I could never figure out what to DO with it. It’s a cool setting, probably one of my favorites, but you’re locked out of doing anything interesting for a long time. 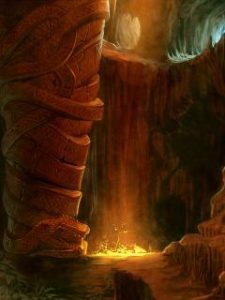 So what is all of the cool stuff you imagine doing in Dark Sun? With quests I have no idea. But with a sandbox there are a lot of cool things to encounter. Caves that offer shelter in the desert and possibly water, but which probably are already occupied by something. Refuling on water should always be a priority. Or you find a ruin burried in the sand. A hidden slave tribe camp and the slaves don’t want you to leave and tell others about them. A merchant caravan that keeps getting raided and pleads for help to reach the next safe outpost. People fleeing from Templars. Scripting an adventure around these seems pretty difficult to me as well. But simply as a situation the players can handle as they like seems much easier to do. 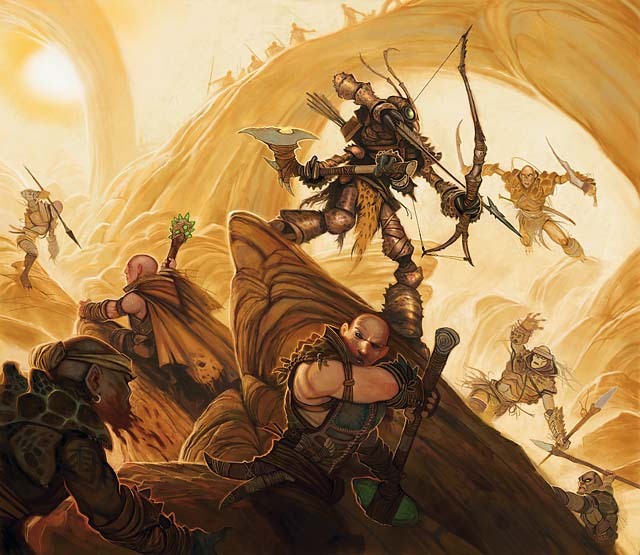 A problem with Dark Sun is making the players care about what they are supposed to do. The setting pretty much sets PCs up to be selfish survivors and not generous defenders of the just. In a sandbox you simply give them situations and let the players chose about which ones they care and what they want to do about it. Though I have to say, Dark Sun is actually much better in this respect than Planescape. That one is the most amazing fantasy world that I find impossible to run games in. I’ve always wanted to play Dark Sun. It’s always sounded like the coolest official D&D setting. Previous Previous post: Quicksand Sandbox: What are we going to do tonight, Brain?